Over the years - in the beginning - at the start of our False Bluff project - whatever! Outlining our boundaries was going to be important. We had begun something large and different for the part of the world we were in. We were going to make some huge changes; and it was necessary to set a pattern, to establish an outline. A fence was like our foundation. 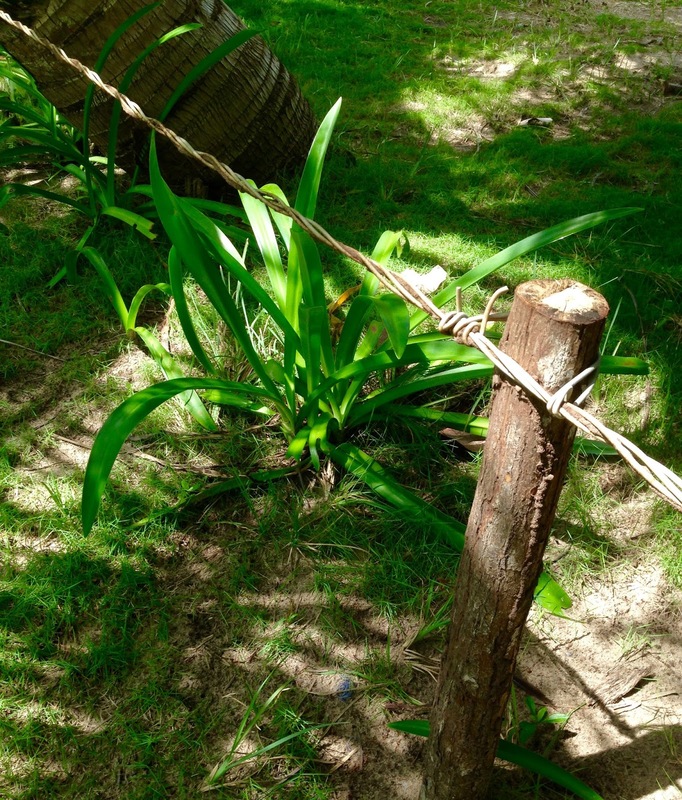 So we planted wooden posts at a fairly standard wooden post height and spacing; and then strung three (or four - I can't remember) strands of galvanized barbed wire. We didn't choose barbed wire for its barbs but because it was, and still is, about the only wire fencing locally available except for chicken wire. Houses in Bluefields often put up elaborate and usually lovely hand-crafted wrought metal fences. That sort of thing wasn't going to do it for us because we've got a pretty extensive "lot" to outline. And so, barbed wire by default was the only game in town. As I've written before, there's salt in the sea breezes that roll in off the Caribbean and those breezes are good for some things. But they're not good for plants and they're really not good for metal...even galvanized metal...and that's an understatement. The barbed wire literally disintegrated in about three years: it just turned to powder. Our next approach was to cut the fence posts in half before we planted them in the ground and then between each fence post to tie a narrow wooden pole at about waist height. Shorter posts drastically cut the number of posts we needed and the narrow poles we tied between the posts were about twelve feet each, a farther distance than we had used when we strung the barbed wire...and so another reduction in material for the fence, especially since the narrow poles were tied between the posts rather than nailed to them. The long narrow poles between the short fence posts gave us a fence height that was awkward for potential trespassers to navigate...a little too high to comfortably step over, a little too low to comfortably bend beneath. Nothing we did in the way of fencing would stop a determined trespasser. Mostly what we were doing was providing outlines of spaces never before outlined. This fence made for a nice, somewhat natural and inoffensive look; and it was pretty effective. But termites, the enemy we love to hate, gobbled up the narrow wooden poles between the fence posts faster than the salty air had eaten the barbed wire. For some reason, although the posts were also wood, they were of a type of wood the termites didn't find as tasty; and so the posts lasted longer than the waist high poles that had taken the place of barbed wire. The latest iteration of our fence is the best yet, thanks to Jose Louis's stroke of genius and of his bargaining powers. We're using wire again, but we're using scrap aluminum that's strung between the posts at the same height as the narrow poles had been tied. Aluminum will stand up to the salty air much much better than barbed wire. All the credit for this goes to Jose Louis.